Pour into a glass. Slurp. Get amazed! The caramel and lemon bring out a depth of flavor you wouldn't ever imagine existed in a pineapple. I loved it, and I hope Harini likes it too. It's last minute, as all my FIC entries have been so far, but at least I made it in time. Love it esp. when it is made with FIC in mind;) Thank you for sticking to the time:) I wonder how caramalised pineapple tastes - has to be good of course! I don't get them but P does sometimes! Harini - I enjoy thinking up the recipes for FIC too. 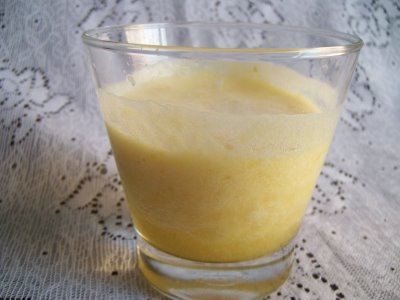 Roasting pineapple n turning them as juice with lemon n pineapple juice, woww am speechless, would love to have this delicious cream juice rite now.. Very nice. Looks so tempting. Love the idea of roasting it before blending. What a yummy idea! Lemon juice must be adding a real zing to the caramel and pineapple! Very creative. That is a lovely idea Simran. Love the look and sound of it.